PRESENTED is an exceptionally well made wool work, often referred to as a woolly, of an early British steam merchant ship assisted by sails on four masts. The forward to masts are square rigged and the aft two are fore and aft rigged. It is in exceptional condition. The ship has no bowsprit which tells us the time is about 1875, fifteen years after sailing vessel hit their high point. She fly's the Union Jack or Red Duster from her stern, and a modified version of it with a white border from her foremast. This indicates she has called for a pilot to help her enter port. Of the two small sailing vessels to her port side, the lead one might be the Pilot boat. Note the intricate scroll work on the ship's bow and stern. This is a not often seen embellishment. The work has a complex stitched mat that is in a light tan/grey with red detail that adds a formal look to the ship. The small stitches are worked in shades of blue, black, white, tan and red. Some are faded with age such as the ship's hull which was likely black originally. This adds to the pictures charm. All the stitching is intact and there is no evidence of damage. The picture was taken under glass using incandescent lighting. In some photos, the colors may be brighter than when view in daylight. MEANING OF FLAGS: The Union Jack with the white border on the foremast truck was authorized for use in 1823 to call for a ship's pilot and was known as a Pilot Jack. The flag on the mainmast truck is generally the "house" flag which signifies the owner of the vessel. It is usually in the shape of a rectangle or a swallow tail pennant. The flags shown are pennant style. The shape of the flag on the third mast looks like a house flag and the one on the last or mizzen mast might be a Royal Navy Reserve status flag. The flag on the staff at the stern shows the vessel's nationality as British and dates from 1801. CONDITION: The woolie is in excellent condition. There are few if any broken threads and there are no moth holes or water staining. All stitches are tight. The colors are faded in places such as the ship's hull and the border. Somewhere in the past, it was removed from a stretcher and mounted on cardboard. The small pilot boat shows a small imperfection on its mainsail. Condition is probably the most important consideration. Are the threads intact, are they stretched, water stained, moth eaten, etc. Expect to see some fading of color which is a good indication of age. Color: Bright vibrant colors may be the sign of a recently made piece, but it also could be that of one that was stored away or out of the sunlight which would be a good thing. Complexity of design: Woolies that have more than a simple profile of a ship are more valuable. 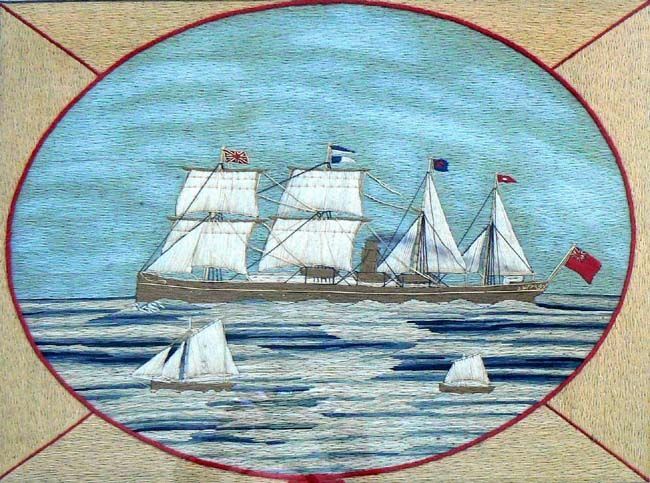 Some have land in the background, the name of the vessel, various flags flying, crests or other embellishments that add value. Design: Some sailors had a knack for composition and color sense which make the work visually appealing while others ended with an unattractive scene. Size: The larger the size, the higher the value. Most woolies are about 16 x 24 inches. 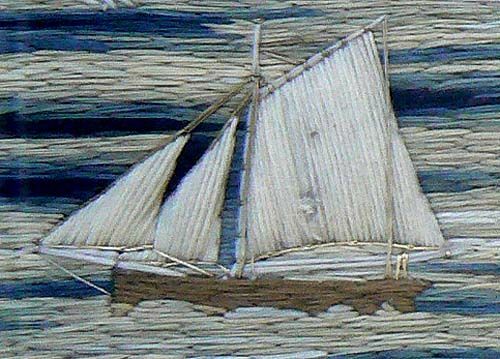 Stitching: There are various stitches that sailors used many of which came from sail making, but others learned the art of embroidery so they combined complex stitches for detailing. This adds value. Long stitches take less time, and therefore closely spaced stitches add to the value. HISTORY: British sailors crafting woolies were talented needle workers. The height of popularity of this form of folk-art was between 1840-1880. The sailors learned their craft through their daily routines of repairing the ship's sails and taking care of their uniforms. They made the most of their limited spare time and personal space by creating works of art that could be rolled up ,, and stored under their bunks when not being worked on. These sailors were knowledgeable about their ships and their surroundings and were skilled at drawing on canvas and then transforming a simple sketch into a vibrant, detailed, and interesting ship picture. Their accomplishments is magnified by being self taught and creating their works for the satisfaction they gave since there was no profit motive. The overwhelming majority of woolies are unsigned. 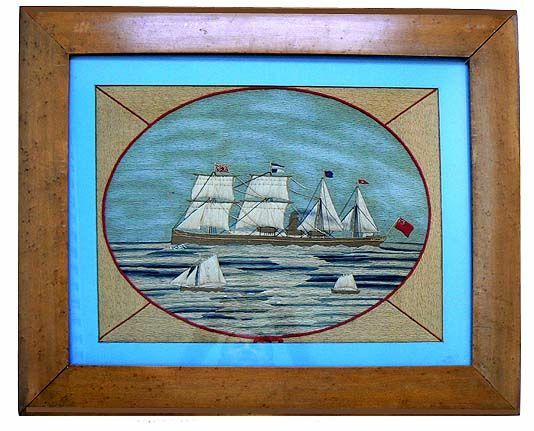 Gallery prices for works such as this can range from a low of $4000.00 to a high of $35,000.00 on the average..
An excellent wool work of a British Sail assisted Steam vessel of about 1875 in excellent condition.